Browse: Home / Which Would You Rather? Camel or Horse? What happens when you put a horseman on the back of a camel? He gets to thinking about livestock. Sparse thoughts. Comparative thoughts. Saddles. If we are not to judge books by their covers, then the saddle is the rider’s next impression of his mount. With a cowboy’s saddle you get stirrups. No need for sturrips on a camel saddle, since a well-trained camel lays down for the rider to mount and dismount. With a cowboy’s saddle there’s a leather seat. Not exactly plush, but it’s rugged and leaves no doubts about what goes where. 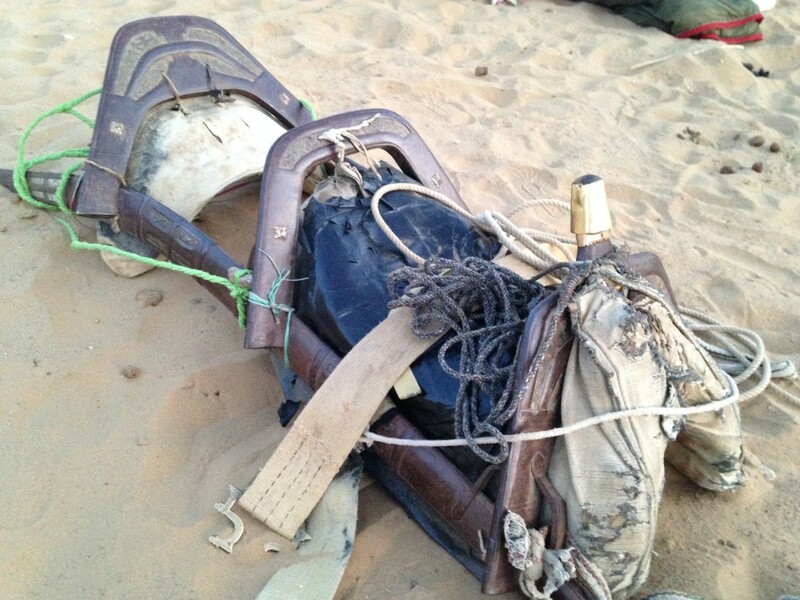 A Rajasthani camel saddle, on the other hand, is just a metal frame. Over the single hump and strap it on. It’s up to the rider to provide whatever seat they need. That’s a good idea for nomadic people: why not sit on your plush tent while riding, and use the same cloth as a roof when you’re dismounted? A Rajasthani camel saddle, sans camel. You might think the hump goes between the arches of the frame, but no, the hump goes right under the middle rib of the frame. Ownership. 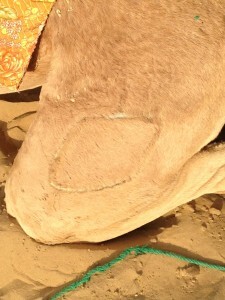 Why was I surprised to see camels branded on the leg with a hot iron? Too much time in air conditioning, I suppose. A branching brand on a camel’s thigh. In North America the tradition of branding horses is disappearing. When I was six, we rode with some branded horses. When I was eighteen we still had horses, but none had felt the iron. A box brand on a camel’s thigh. Feet. Camels have the weirdest darn feet. Each foot has two immense toes, with a wicked-looking nail at the tip. The fore feet are considerably bigger than the hind feet. Those front feet spread out like a vast, squishy dinner plate when the camel shifts its weight forward. The feet adapt to terrain and spread out the pressure when a camel’s walking on loose material like sand. Camels have the most amazing feet: Darwin walks beside the camel at every step. You can’t say Darwin never touched a horse, but by comparison, a horse’s feet seem poorly designed. Or maybe just designed with one thing in mind, speed. A horse needs their hooves trimmed. A horse might need shoes for traction. A wee pebble might make a horse lame. Gait. A camel’s got that short body and long legs. Consequently, the space in front of the hump, were we riders perch, rocks forward and back, forward and back while we amble through the desert. 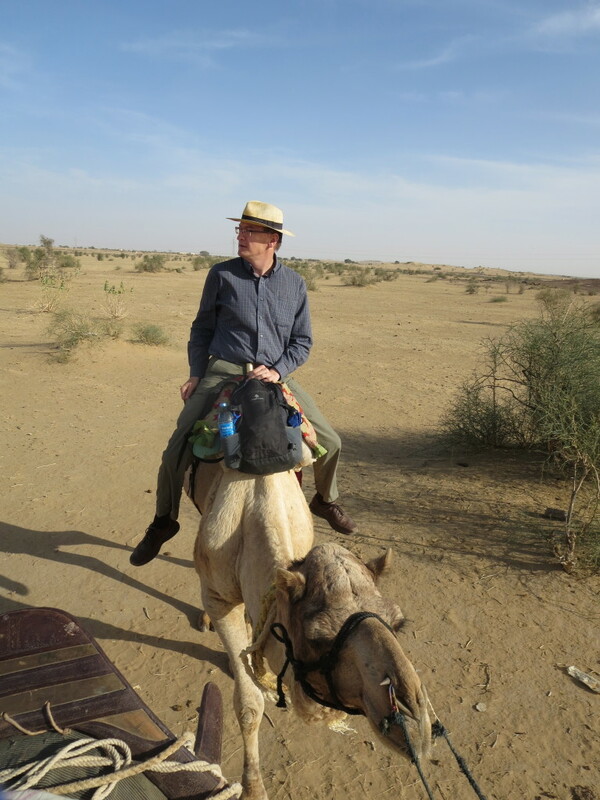 At first you worry you might rocket off the front of a camel (The saddle’s got a low pommel and no stirrups, remember? ), but your inner ear quickly makes the right adjustments. At a walk, a horse moves the rider around less. You feel safer in your seat. Don’t camels have a funny trot…ain’t they got a pacing gait? I’m on the lowest level of desert dude ranch and get led around like a kindergartener at the county fair. No self-respecting Rajasthani camel driver lets a tourist touch the reins, let alone run a camel. I can’t say how jerky a trotting camel might be or how smooth they are at a gallop. Lever of Influence. It’s a thing I learned when I was six: where to put your thumb at the back of a horse’s jaw to make them open up and take the bit. The bit: that nasty piece of steel in the horse’s mouth. To avoid pain caused by the bit, a horse might respond to the reins. 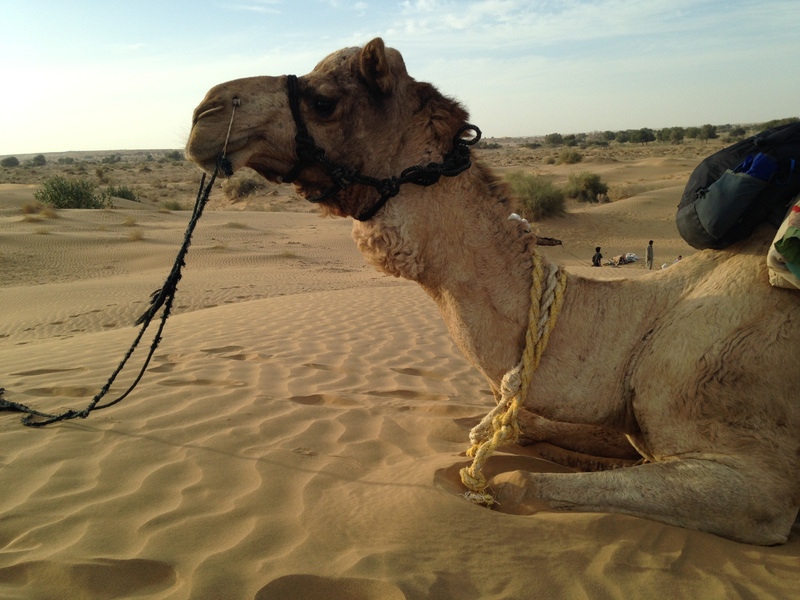 What I learned makes no difference with a camel. Rubbery-looking mouths. Must be too tough for a bit. Camels have pierced noses. 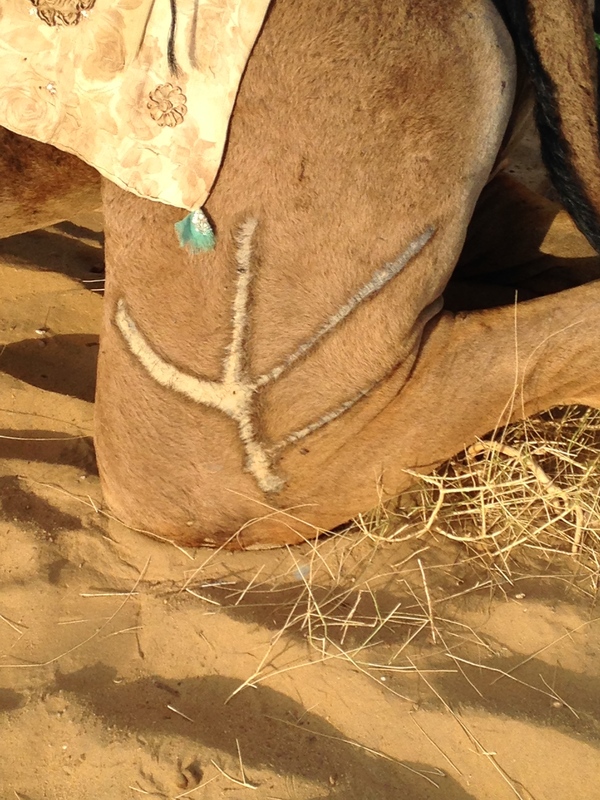 Studs are fitted into the piercings and to avoid the pain caused by tugging on the studs, a camel might respond to the reins. One of our camels, laying down for his rider to mount. When was the last time you saw a horse lay down for anything except a roll in the dirt? There’s no bit in the camel’s mouth. You can clearly see the piercing just behind the nostril and the short stud to which the reins attach. Reins. Before mounting your horse, check: left rein on the left side of a horse’s neck, right rein on the right side of a horse’s neck. “Don’t cross the reins!” My dad trained horses with a soft voice, but not kids. At us he yelled. If I cross the reins, I’ll get on and have little control. The horse might take off running or skyrocket. A horse can kill a person. I remember. And to my surprise, a camel’s reins are always crossed. Left rein loops under the jaw to the right side of the neck. The right rein loops under the jaw to the left side of the neck. 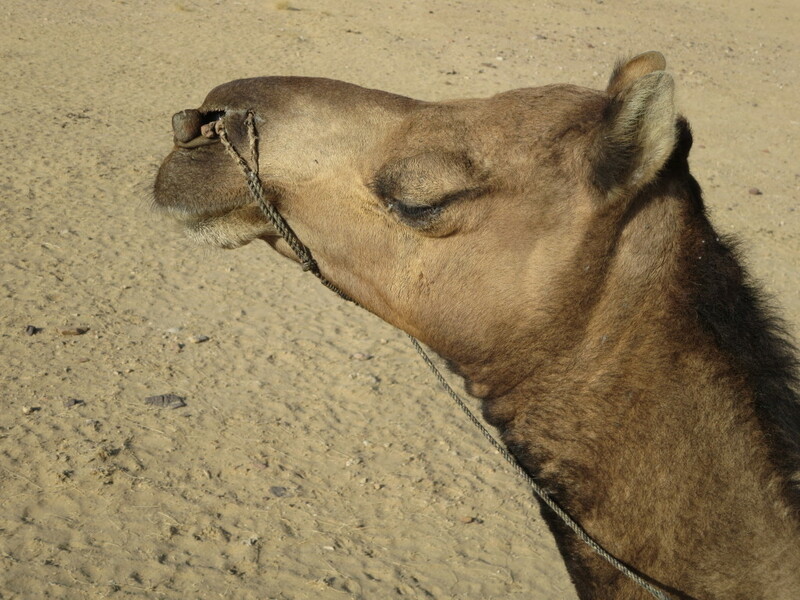 A camel with reins crossed underneath the chin. In this case the camel has an uncommon setup, with the strings passed clear through the nose instead of attached to studs. Did the piercings get overstretched from constant disagreement between rider and camel? Or is this situation common for older camels? I think about it. And I wonder if the downward pressure on the studs makes them less likely to pop out of their piercings. Our camel driver says half a dozen words, all of them quiet. His sons are more given to talking. I don’t ask if he yells. But I wonder. Did he yell “Always cross the reins!” when he taught them to ride? They ride well. They are easy in the saddle. Willfullness. ‘Domesticated’ and ‘servile’ should never be confused. At the ranch we had a horse whose favorite sport was trying to run home when she thought the work was done. We had another horse who, when he had an inexperienced or inattentive rider, thought it funny to walk under the lowest pine branch he could find. Could he knock off their hat? Could he brush off the entire rider? There is no end to the games horses play. I might have guessed. My camel’s got the same game as Bill, but no pine trees. He stretches to the very limit of his lead rope in order to traipse through the tallest bush in the Thar Desert and try to scrape me off. Intelligence. A lot of horse lovers will tell you how smart horses are. Horses are cagey, but they’re not that smart. Not nearly as smart as a pig. Nothing close to dog. I should give most horses credit for being smarter than most cows. Camels are cagey, too. Tough. But not especially smart. Smarter than cow? Maybe. Probably. But not by a whole lot. You can train a cow to the yolk, like a camel. I’ve never tried to pierce a cow’s nose and saddle it up. It might work just fine. Pain. We have a word for what happens to equestrians who are out of practice: saddlesore. Sure, your rear-end can get tender, but what really gets most greenhorns is their thighs and knees, if they’re riding right, with heels down and signaling more with legs than reins. My first summer home from college, I helped the neighbors gather cattle off a sagebrushy, rattleshankey piece of ground, wittily called “Pleasant Valley.” It was maybe five hours worth of work ahorseback. The next day I could barely stand. No stirrups with a camel. A cushy tent to sit on. How could there be any problems? 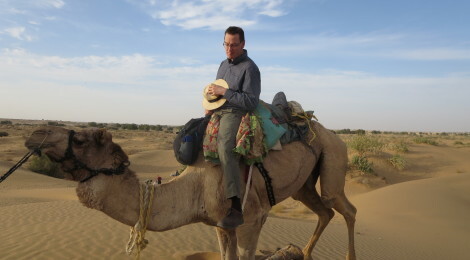 Astride a Rajasthani camel. Notice how my legs are all a-dangle. The rider uses nearly no leg muscles to keep his seat. Perhaps he’d need his legs if he was in directing his mount rather than dragging up the end of the pack train. Forward and back, forward and back. That rolling camel gait gives the greenhorn a light case of whiplash in the neck and low back. On the ride I am ignorant, but early in the morning my spine is happy to deliver a full report. Useful and informative, as always. Belated bday greetings, Mr. Dennis, and happiest travels to you both! I dare you to put this information to use in the next month! Are they giving camel rides in Central Park or on the Boardwalk these days? Did you make make it Oregon for my birthday? Did I say my birthday? I meant Anna’s birthday. Make sure you get a camel for BV, too.